Posted by Madeline Patton on May 7th, 2018 at 11:50am . This month Rio Hondo College in Whittier, CA, will graduate it first cohort of automotive technicians from its new Tesla START program. Rio Hondo and Central Piedmont Community College in Charlotte, NC, are the first U.S. sites for the 12-week Tesla certification program that teaches automotive technicians about electric vehicles and Tesla-specific repair procedures. Professor John Frala, alternative fuel technology instructor at Rio Hondo, attributes Tesla’s decision to locate its program at Rio Hondo to the innovations he has been able to introduce with support from two National Science Foundation (NSF) Advanced Technological Education (ATE) grants. The official ribbon-cutting of the 4,000-square-foot Tesla training center with upgraded equipment and six Tesla vehicles is scheduled for May 23. Eleven of the 12 students (four women and eight men) in the first cohort of Tesla START trainees at Rio Hondo College will complete the 12-week certification program this month. The one student who had to stop out for personal reasons is expected to be in the next cohort of START trainees. The Northwest Engineering and Vehicle Technology Exchange (NEVTEX) project is developing national education standards for technicians of electric-drive vehicles with guidance from auto industry representatives and automotive technology educators. Frala said Tesla’s certification program fits well with the hybrid/electric vehicle/fuel-cell technology associate of science degree program that he developed with his first ATE grant (Award #1501735). He is a co-principal investigator on a current grant for the Northwest Engineering and Vehicle Technology Exchange (NEVTEX) (Award # 1700708) that is led by Ken Mays, program director and professor of automotive technology at Central Oregon Community College in Bend, OR. The NEVTEX project aims to develop national education standards for technicians of electric-drive vehicles. This month the project’s leaders are convening a meeting with auto industry representatives to draft the standards that will emphasize safety. Mays and Frala plan to have 20 colleges and industry locations begin testing the technician standards in 2019. 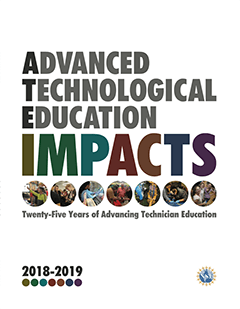 The two automotive technology educators met in 2014 when they received mentoring and technical guidance from Mentor-Connect, an ATE project that helps community college faculty prepare competitive ATE proposals. “When you get to be part of the NSF family, things come your way,” Mays said. For the groundbreaking degree program that he developed with ATE support Frala was a finalist for the 2018 Faculty Innovation Award from the American Association of Community Colleges and received the 2016 Clean Air Award in the Education and Outreach category from the South Coast Air Quality Management District. He has also participated on California Governor Jerry Brown’s Green Team, an advisory group for the California Hydrogen Highway and its hydrogen refueling stations. Other career opportunities include speaking engagements. During a keynote address in March at a conference attended by 205 guidance counselors Frala explained that automotive technology “is not grimy as in the past.” He also emphasized that new technologies have raised employers’ expectations. Automotive technicians now need to know physics, chemistry, and math. They must also be able to communicate well with customers and work teammates. He points to the Tesla START program as an example. In addition to covering the trainees’ tuition and fees, Tesla pays them hourly wages while they attend classes. Upon completion of the 12-week program, the trainees are eligible for Technician II positions at Tesla Service Centers that pay between $21 and $26 per hour in California. Tesla has seven service centers within 50 miles of the Rio Hondo campus, which is located 15 miles east of Los Angeles. Frala has received queries about the trainees from Tesla service centers outside the region too. If trainees are hired by a Tesla center elsewhere, their relocation costs will be paid by the company, Frala said. “They will hit the ground running,” Frala said of his students’ qualifications and career opportunities.